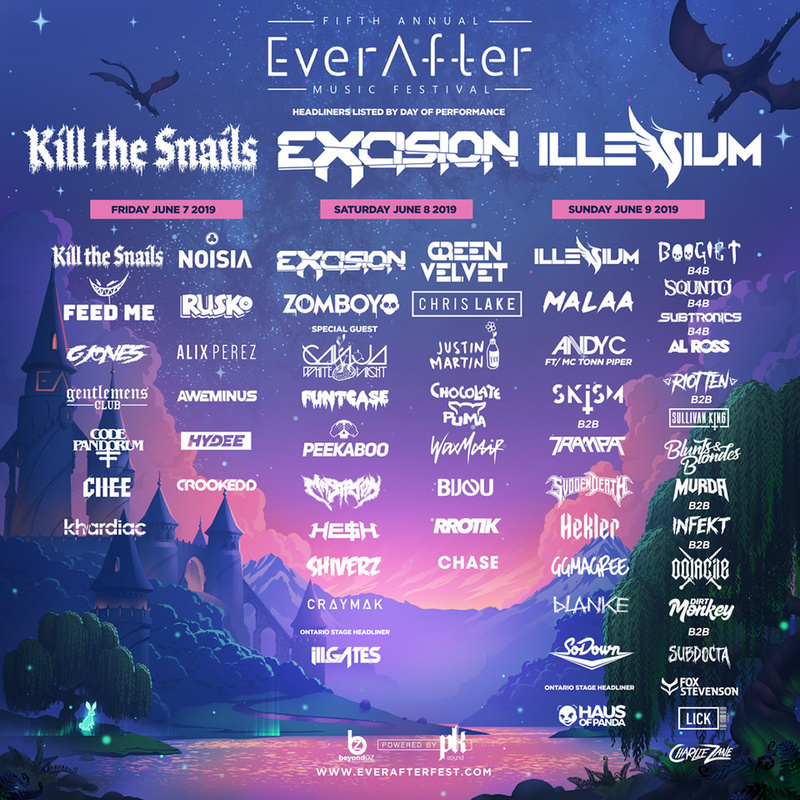 Ever After Music Festival returns to Kitchener, Ontario for it’s fifth year of heavy-hitting fantasies. This festival continues to thrive on the path of success because this year looks to be the year you don’t want to miss! To say this 2019 lineup is blazing with talent would be an understatement. Back by popular demand, Excision, Illenium, Zomboy, and many more familiar faces will be taking the stage throughout the three day event. Filling one of the headlining spots is a Canadian debut Kill the Snails (Kill the Noise B2B Snails) set. G Jones, Malaa, Chris Lake, and Justin Martin are spicing up the bass for this predominantly dubstep festival by showcasing their rare sounds and giving festival goers a chance to groove to some new beats. This hefty festival wouldn’t be complete without multiple spine shattering back-to-back sets. If your neck doesn’t snap by Sunday, be sure to check out the famous B2B duo Boogie T and Squnto going B4B with Subtronics and Al Ross. SKisM and Trampa will be going B2B as well as Riot Ten and Sullivan King to help close out this heavy-hitting festival experience. Ever After will be held June 7-9, 2019. Tickets are available now.